I wanted to make this project for myself, and since this is very simple project, I placed a challenge to complete it in shortest time possible and make it work as I intended to. From idea to finished product it took about 4-5 hours, including designing schematic, routing PCB and making it, programming the device and etc. What is important is that finished product works like I want it to do, and it could be used as opportunity to learn something about other platforms different from some that are spamming us 24/7 like Arduino. One thing I want to ask you all is to share your opinion, how to make this project better, what would you add/remove, did you use it? Did you like it? Did you make/modify it? Share it with us! What does this project have that others don’t? Well, most likely nothing. 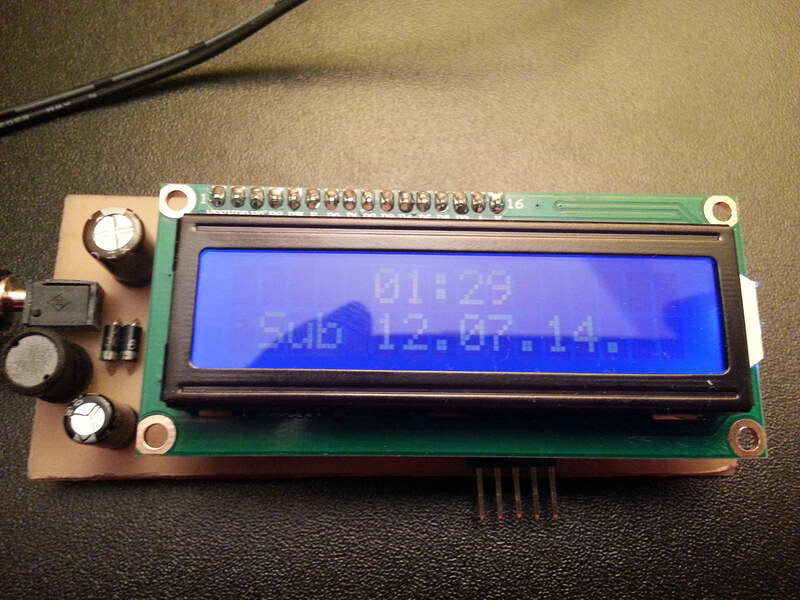 I bet all of you have seen LCD displays, RTCs and etc used in many many projects before. So this project isn’t special in any way. I made it public so anyone who wants to make this clock or project similar to this one, doesn’t have to start from scratch, you can use my project and edit it to suit your needs. Also as a community we can make it better for all of us. Why did I make this project and what it is about? So how many of you like to sleep in completely dark room? Blinds closed, no light coming in at all… Well I can sleep in whatever conditions, but my wife likes to sleep in pitch black room. So what did I do? I made a small clock with back-light, that I can place by the bed, on the floor and I will be able to see what time it is and on the same time, it isn’t bright enough to prevent my better half from sleeping. — Collection of datasheets of all components used in this project so you can check and see how things work and how they are set-up. — Schematic of the whole project in JPG format and PCB and Silkscreen so you can see the dimensions of the finished PCB and how components are placed around the PCB. — Images of the finished product, this is how it looks when it’s done and fired up!